What To Bring: All units have sheets and towels provided (see your confirmation for details). All rentals are equipped with blankets, pillows, fully equipped kitchens with utensils, and cable TV (two units have Ruku box only). Your unit is also equipped with the amenities on your confirmation. If the property you rented has a hot tub, you may want to bring a few extra towels. You should also bring personal soaps, detergents (laundry and dish), toilet paper, paper towels, and garbage bags. We provide 1 roll of toilet paper per bathroom and 1 roll of paper towels in the kitchen. Office Hours: Monday through Friday 9:00am-5:00pm. Holiday and seasonal hours may vary. After Hours Check-In Info: We can make arrangements for after hours check ins. Please contact our office for details. After Hours Emergencies: We have a 24 hour answering service available for EMERGENCIES when our office is closed. For non-emergencies please call during business hours. Maintenance and Housekeeping: Our maintenance and housekeeping staff are here to make sure your vacation home is in the best condition that it can be. If you should discover otherwise, please report it to us immediately and we will do our best to correct it as soon as possible. A Reminder: You are renting a privately owned home or condo. It has been equipped and decorated to satisfy the particular tastes and desires of the owner. The condition of the unit and its furnishings vary according to the age of the home and the care given by the owner. Please be considerate of the belongings of the owner and to the people who will be renting the unit after you. Smoking Policy: There is NO SMOKING allowed in ANY vacation rental. Please smoke outside with the door closed, use a proper disposal for ashes, or smoke off the premises completely. If cigarette butts need to be picked up after your departure, you will be charged extra. Check Out Procedures: Please return the keys to the lock box located at the house and be sure to lock the box with the same procedure to open it and be sure the house is locked up and all windows closed and latched by 11:00 am. Heaters must not be turned off, leave heater on and set to 55 degrees. We provide departure cleaning for you. We ask that you leave the property neat and orderly. 1. Remove all food from refrigerator. 2. Load dishwasher and start. 3. Wash, dry and put away pots, pans and any items not able to go in the dishwasher. 4. Leave furniture arranged as you found it. 5. Put garbage in sturdy garbage bag and either put in complex dumpster (if available), or leave bagged up in the kitchen or laundry room. 6. Close and lock all windows and doors. 7. In cold weather, leave heat on 55 degrees. Do NOT turn the heat off as pipes could freeze and cause serious damage. Deposits: Your security deposit will be mailed or refunded to your credit card (if used for the deposit) within 2 weeks from your check-out date. Items Left in the Unit: Tahoe Select Rentals is not responsible for personal items left in a unit. There will be a fee for returning items left behind. A Few Notes: We do not recommend the use of sofa sleeper beds by adults as they may be uncomfortable. No refunds can be issued if found uncomfortable. We cannot guarantee spas, hot tubs, electronic equipment, appliances or phones but will make every effort to make sure that repairs will be made as soon as reasonably possible. Any refunds made will be at the discretion of Tahoe Select Rentals. No refunds will be made for TV malfunction, kitchen appliance malfunction or other electronic equipment malfunction. Upon your departure, if a hot tub is left excessively dirty, you may be charged for a clean and fill from your deposit (minimum $50). Please do not take food and drinks or put bubbles or solutions in the hot tubs. Reservations are not predicated upon weather or snow conditions. 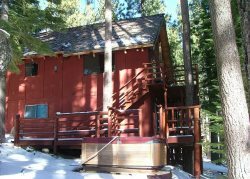 At the discretion of Tahoe Select Rentals, a partial refund or change of dates will be considered if roads leading to Lake Tahoe are closed for a substantial time. Since winter weather is unpredictable, we recommend you carry chains at all times and check road conditions prior to arrival. In the event the property is not rentable due to sale, damage or unforeseen circumstances, we will provide comparable accommodations or a full refund.